Treehouse Blogs - The Wisdom of Experience - Treehouse by DesignTreehouse by Design - So, you thinking about building a tree house? It’s spring again and you’re probably thinking about building that treehouse you’ve been dreaming about but never got around to building. You can read all the books and take all the courses you want, but there’s nothing like lived experience. That’s where treehouse blogs come in handy. 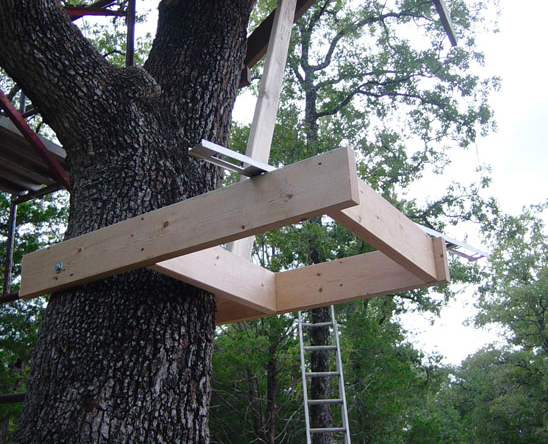 If you’re looking to build a treehouse, chances are you’re going to want and need a little help. In my many searches for all things treehouse, I’ve occasionally come across the odd treehouse blog from people who built a treehouse themselves and wanted to share their journey and wisdom with other would-be treehouse builders. Because treehouse projects are, though often slow-going, ultimately finite undertakings, a very common characteristic of these blogs is that they end when the treehouse is built. No matter, because these testaments to the trials and tribulations of creating a treehouse remain valuable to those of us who have yet to get our hands dirty. Danny Sullivan’s treehouse blog documents his treehouse building process from sketch to completion of the roof in 2007. He got his design from a book we reviewed last year. Steve France’s treehouse blog from 2007-08 features images and video to give you ideas for building a loft, skylight, porch, roof, and swing. 16 Feet is an interesting blog that chronicles the treehouse experiences of a couple from building their treehouse in 2006 to their treehouse adventures and innovations up to 2010. Though a little short on details for those looking for specific building know-how, the blog hosts lots of close-ups of treehouse details. It’s a great place to look for ideas. Remember, these are just a few people’s experiments and journeys with treehouse building. The design ideas aren’t necessarily the best (like affixing beams directly onto standing trees instead of using hardware that will allow the tree to breath and grow), but they’ll give you some ideas for how you can build a treehouse of your own. They will certainly inspire you and show you that it’s possible to build a treehouse yourself. They’ll also help you to avoid some of the problems these treehouse bloggers ran into on their projects. If you combine reading some of these hands-on blogs with some of our blog posts on the more technical aspects of good treehouse design, you’ll be well-equipped for your own project. I also invite you to take a look at some of our own posts on treehouse building dos and don’ts. Do you know of other valuable treehouse blog resources? Let us know!